Even the greatest investor in the world knows how important these 2 emotions are to successful investing. Likewise, you should also learn these 2 emotions well and master them so that you will not fall into the trap that so many people who lost money in the market do. The emotion of greed is responsible for stock prices soaring. That is what really moves a stock. People do not want to miss out on the moves that a stock make and therefore many go chasing the stock higher. Imagine one day you heard about a tech stock making a big move of 20% in a single day. Your neighbor bought the stock and now he is sitting on a handsome profit. He brags about it and soon his friends start to buy the stock. For a few weeks the stock keeps rising because more and more people buy the stock. When a stock is in demand, the price soars higher. Everyone wants to make a quick profit. Greed propels the stock higher. By the end of 3 months, your tech stock has moved from $50 to $150. One fine morning, the tech stock releases a news that their company is not doing very well in the market. Sales have been slowing down and before you know it, the stock gaps down 20% in just a few minutes. Your friend has lost about $200,000 from the drop and he soon gets panic and tells everyone about it. Those who have invested in the stock also suffer the same thing and they are afraid that they will lose a lot of money. By the end of the day, the stock ends 40% lower. As more and more people get news of the drop, fear creeps in and people start to sell more of the tech stock. By the end of the month, the stock has dropped from $150 to $35. $15 below the original price you and your friends bought the stock. It is not uncommon to see stock move up 50%-100% in a week only to lose all the gains the next week. 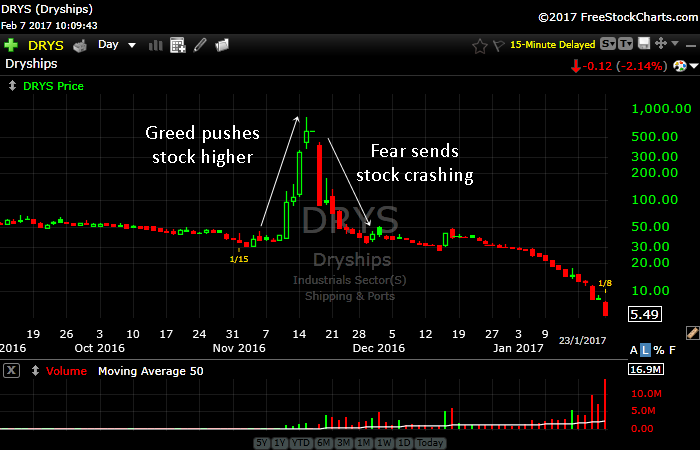 Below is a chart of Dryships, the stock shot up from around $50 to $800 in a few days only to lose it all and more in a few days time. Nothing is rational in the stock market when you have human beings that are emotional. That is why you must learn to master your emotions. Warren Buffett said it right, we need to be fearful when others are greedy and greedy when others are fearful. 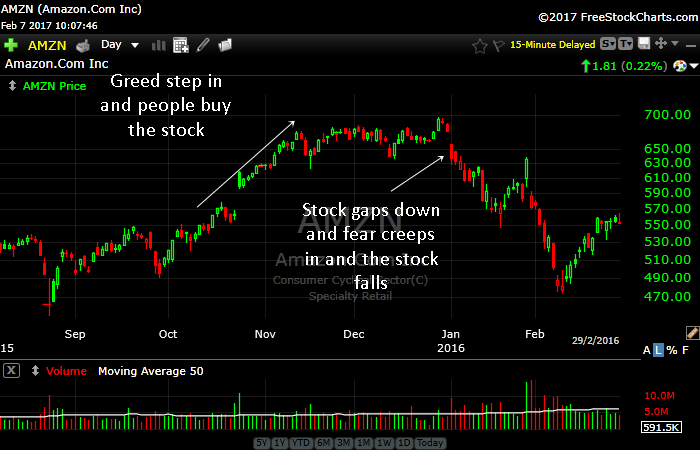 How Can We Recognize Fear And Greed In The Stock Market? Now that you know how fear and greed can move stock prices you might be wondering how can you recognize these two emotions? 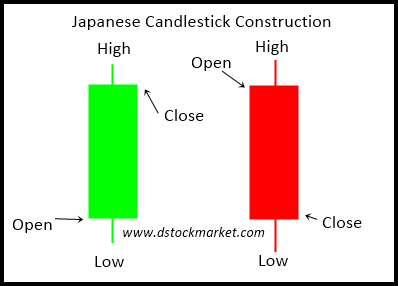 Well, let me introduce you to the Japanese Candlestick Chart. In the previous charts that I have shown you, each individual bar is a candlestick bar. Each bar in a daily chart represents one day of trading. If you are looking at a weekly chart, each bar represents one week of trading. If you are looking at an hourly chart, each bar represents 1 hour of trading. Normally a green bullish bar is represented by a green candle. A bearish bar is represented by a red candle. Green means money, red means losses. You will notice there are wicks on the top and bottom of the candle. They are the highs and lows of the day. The solid area are the bodies. In a bullish candle, the opening price is the lower left of the body while the closing price will be on the upper right hand side of the body. In a bearish candle, the opening price is at the upper left of the body while the closing price will be on the lower right of the body. So what is greed and fear in candlestick language? How do you recognize them? Large green candles or large red candles do not simply appear out of nowhere. They are the footprints of investors and traders who bought a lot of stocks on that day. Or they could be their enormous selling activity that caused the big red candle to appear. In a mid to large cap company, you cannot move the stock much by buying 10,000 or 20,000 stocks. For a meaningful move to happen in these companies, you need to have huge volume on that day. A huge volume can be 10 million or 30 million shares being traded that day. We sometimes call this phenomenon unusual volume. 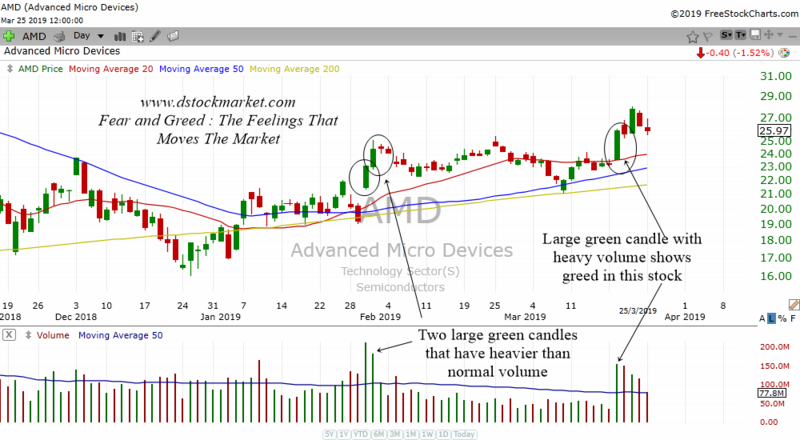 For example, in a stock that trades 1 million shares a day, you would probably need an unusual volume of 3 million to form a large green candle. On the other hand, if a stock trades 5 million shares a day on average, you would probably need an unusual volume of 15 million to form a large green candle. So do keep that in mind when you consider the amount of greed and fear that is needed to move your stock. 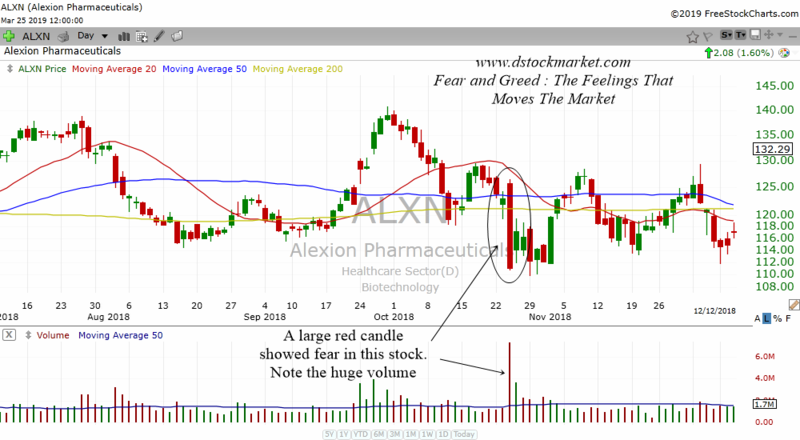 The chart above is the daily chart of ALXN. Can you spot the huge red candle? Well heavy selling in the stock on that particular day caused the big red candle. Notice how the volume shot up. Compared to the trading volume on other days, you can see it spiked up a lot. The average volume traded is represented by the blue line on the volume. The big red bar happened with volume that is several times the normal volume. This showed a lot of fear that happened in this stock on that day. The above is the daily chart of AMD. Well as you can see it has a few large bullish candles that have heavier than normal volume. What happened on that day? And why did volume came in bigger than normal? Well the answer is traders or investors bought the stock and helped to pushed the price of the stock higher. The heavy volume shows commitment in the stock. It also tells us about the greed of market participants. Now that you know how to look for fear and greed, how do you interpret all these data? It might take some time for you to digest all these information but as you chew on it and look more at stock charts, you will begin to understand what I mean. The daily chart of AMZN above gives us some good examples of how fear and greed is at work. By the way there are many times that a large green candle or large red candle is not accompanied by unusual heavy volume. That is alright. What is important is for you to notice the larger than normal candle. 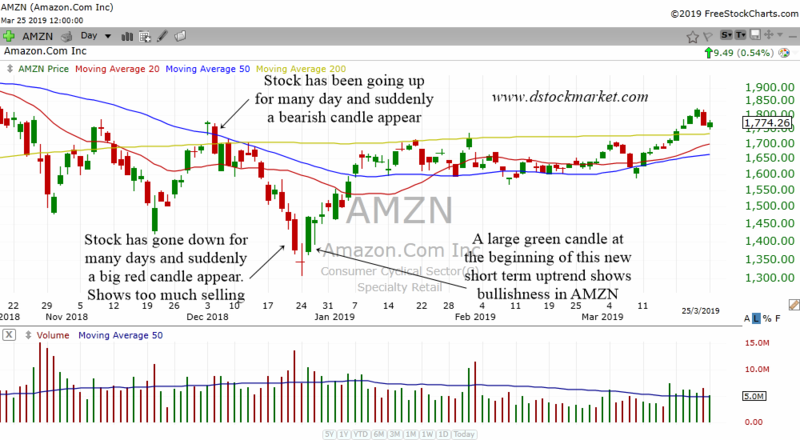 AMZN had a nice rally up near early December 2018. After many days of rise, it went to the 50 day moving average as well as the 200 day moving average. If you have a bit of basic knowledge of moving averages, you would know that the 50 day moving average and the 200 day moving average can be a source of resistance when the stock meets it from below. A large red candle appeared at these 2 important moving averages. Prior to that there was just a nice move up with no large red candles. The large red candle at the resistance area pointed to us that the stock was about to change trend. The short term trend has been up for quite a while. Therefore, the presence of this large red candle is a bearish reversal candle. Notice how the stock slowly drifted lower after that and then quickly accelerated to the downside. Near the end of the short term downtrend, the stock suddenly had a large red candle. Prior to that there was no large red candle. The presence of a large red candle near the end of the short term downtrend told us that people were throwing in the towel just before the bearish trend ended. Remember the quote by Warren Buffett? Here is a good example of the quote in action. Because of the great amount of fear, the large red candle represented those who were so scared that in the end they throw in the towel. Have you ever been in a situation where you hold the stock and hope it rises back up. Then you see the stock dropping and dropping and dropping. Your account goes into a big red and in the end you couldn't stand it and then you sold off the stock. Only to see it rise up in the next few days. The large red candle at the end of the short term downtrend paints this situation very clearly. The next day after the large red candle, a doji appeared. Hence the large red candle at the end of the downtrend told traders to think about being bullish. The doji can be a hint of a reversal especially at the end of a trend. The next day after the doji appeared a large green candle appeared. This was the beginning of a new short term uptrend. The presence of the large green candle at the beginning of the short term uptrend is bullish.